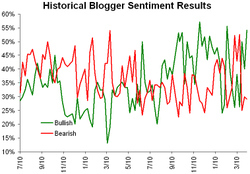 The bulls continue to be bullish into the first month of a new quarter. Boy, I hate to have so much company! Still, while a pullback is reasonable here, there are a whopping 73% of pollees on Traders-Talk.com looking for a correction this week. Chances are, we get a pullback, but only after a shot higher to shake loose the weak handed Bears. Hey, this is very interesting. 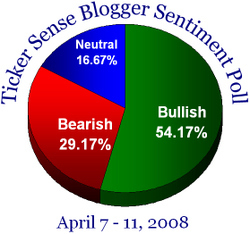 What does it take to be a Blogger Sentiment Participant? Come join us for the happy hour of financial blogs. I'd like to participate in this poll. Our website is wwww.tickermine.com Please visit our site and let me know what you think of our recent channel checks.